I bought the farm in 2008. It was supposed to be a roll-over investment following the sale of three houses in London. We had decided to fund continued capital works at the castle by the sale of some houses and with some money left over we bought the farmhouse. 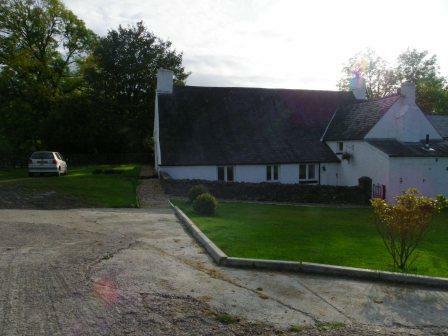 I had plans to convert two large barns into self-catering accommodation suitable either as self-catering holiday lets or as B&B overflow for guests attending weddings and B&B guests generally. 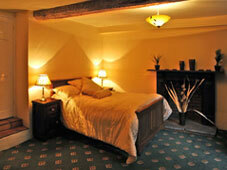 This was back in 2008 when everything was pretty busy on the B&B side. Alternatively I thought I might live in it myself, but later decided I preferred to be on site at the castle. 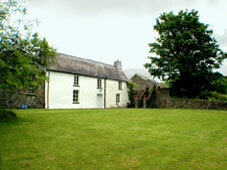 It is now let as a self-catering cottage. We discovered we could not get planning permission for the barns on account of the angled access on to the little lane at the top of the drive. If we alter our access drive so people can look both ways when they come on to the road, 'Highways' will probably not object to the increased traffic brought about by holiday lets in the barns. 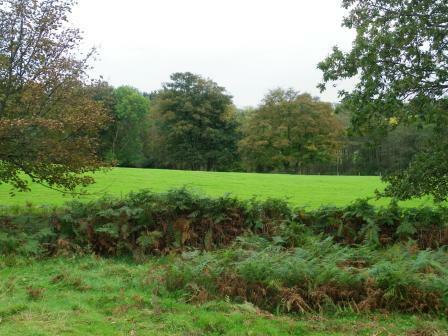 However in order to do this we would need a piece of land adjacent to the drive to take the new drive through, and there is disputed ownership of this section of land. Also we now discover the Council are charging anyone who wants to convert the barns a £90,000 planning permission fee for conversions. 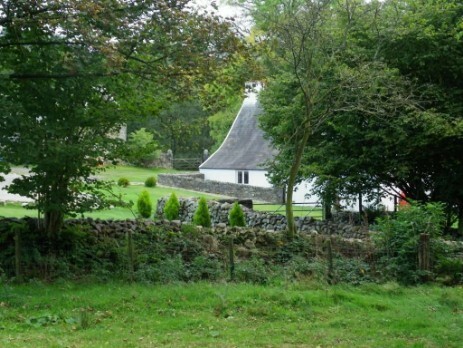 Apparently this is a Wales thing (or maybe it is just a Brecon Beacons National Parks idea) as I have not heard of it in England, where barn conversions have been going on all the time and do not involve a £90k fee. We found a few problems with the farm which took a bit of labour to sort out. 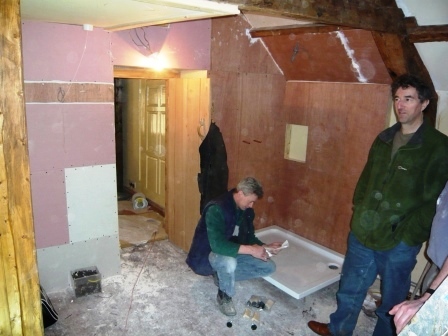 We had two live-in labourers stay on site for a couple of years doing the work. 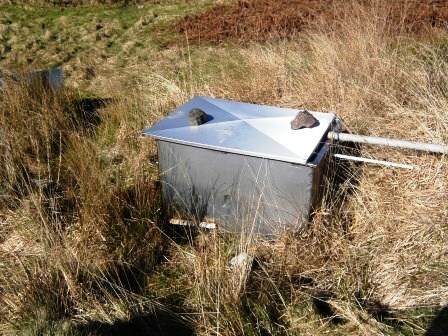 First off there was no water in the summer, as the stream feeding the small cold water tank (shown left) would dry up. Fine for a family of farmers who were prepared to put up with the odd inconvenience of no water, but no use for a holiday let. We found in winter the water would freeze. In summer it would dry up. 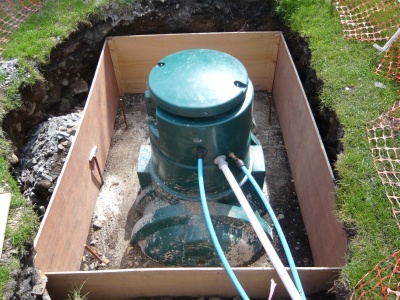 We had to install a £10,000 private borehole to provide adequate water to the farm. Before the borehole we hired a bowser and transported water regularly from the castle. The plumbing was a disaster. 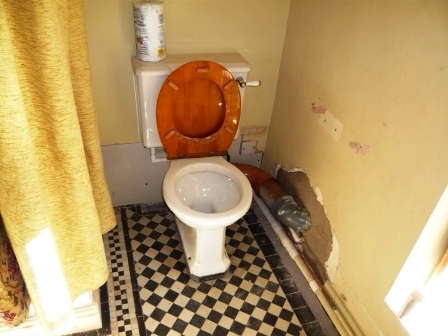 It was impossible to use loo paper in the main bathroom because a saniflow system had been installed by some DIY enthusiast with narrow one inch wide pipes that would block up. There were multiple joins (some of which leaked !) as it snaked around corners, floors, ceilings, up and down room walls. It was crazy. The contents took a quite unnecessary 40 yard detour up into the loft and around the house, before exiting the opposite side of the house to the sewage system. 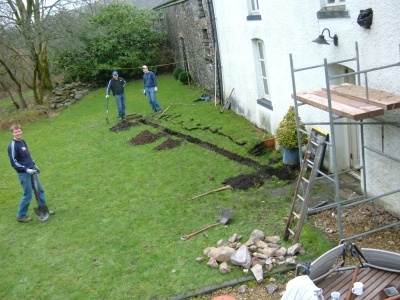 A pipe then passed under the house (within feet of the loo whence it had started its journey) and into a cesspit. We replaced this with a simple soil pipe going out of the wall beside the loo directly to the cesspit - at most a four metre stretch to link directly into the feeder pipe for the cesspit, which was the same side of the house as the loo anyway. Outside the immediate area around the house had become a dumping ground for old iron, machinery and rubbish. 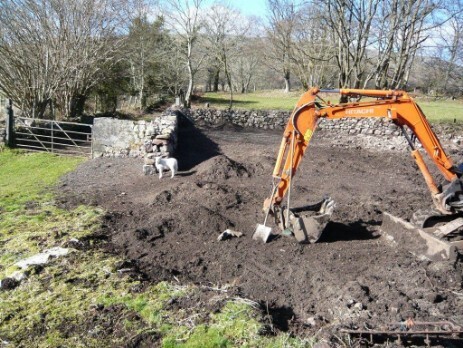 All this had to be removed, the land levelled, and most of the dry stone walls needed rebuilding. This last took a couple of live-in builders several months to complete. Once landscaped, a further few weeks of stone collecting was required to get the soil to a state where grass could be seeded and a large lawned area created. If this house was in private ownershop, someone could have a fantastic garden here. 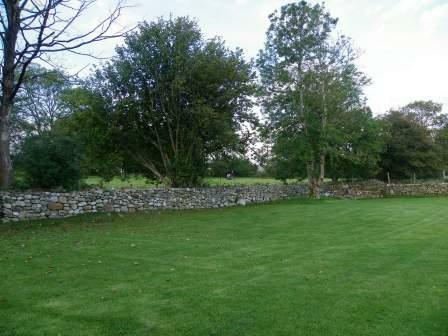 We however have it laid down to lawn and lots of dry stone walls for ease of maintenance. It is for sale for around £530,000 if anyone is interested - with 5 acres or with more land if preferred. It cost me £630,000 in 2007 and we must have spent at least £150,000 on it. What a dull investment that proved to be. Meanwhile the house in London that it replaced is worth £1.1m now! Ah well, c'est la vie. 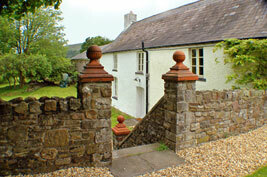 In the season it is fully let for self-catering breaks. 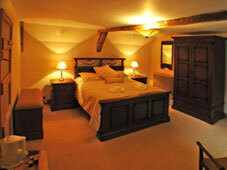 It will provide a reasonable income for anyone who wanted to have it as a holiday home. The Castle could manage its website and cleaning routine if someone wanted to be an absentee owner. I am rather keen on selling it and buying a cottage in Dorset which I will then let as holiday lets in the summer and live in, in the winter (as the boys are going to school there). Pending its sale, when in Dorset I stay in our large Pegasus caravan, which I should have bought earlier, in 2007, instead of the farm!